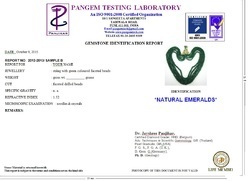 We are a leading service provider for the Gemstone Certification. 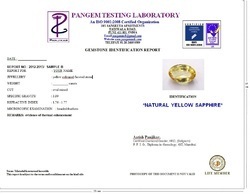 We offer our End Clients / Customers very authentic Natural Blue Sapphire Certification that will authorize them to evaluate and assess gems and jewelery possessed by them. Our courses are most practical and offers our students most relevant information that they need to know regarding the jewels they have. Armed with the knowledge gained they can even help their friends evaluation their gems and jewels. 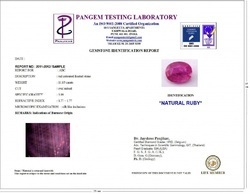 We are reputed for offering quality assured Gemstone Origin Report to our esteemed client base. Our services provides varied testing requirements for gemstones and jeweleries. This service assortment provides authorized certification to these gemstones and diamonds. These gemstones are well scrutinized and after that certification is provided in conformation with many sided quality parameters and norms. We are reputed for offering quality assured Gemstone Jewellery Report to our esteemed client base. Our services provides varied testing requirements for gemstones and jeweleries. This service assortment provides authorized certification to these gemstones and diamonds. These gemstones are well scrutinized and after that certification is provided in conformation with many sided quality parameters and norms. 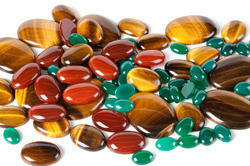 Semi-precious gemstone cabochons are flat backed, highly polished gemstones. Cabochons come in a wide variety of gemstone types and sizes. They do not have a hole but are used for surface mounting onto a variety of findings and fittings. They can be used for bracelets, earrings, brooches, cufflinks, rings, scarf clips and pendants. Looking for Gemstone Certification ?